Mike: it's been a busy week or so. We finally got to see The Avengers (Los Vengadores as its called here). I loved it, we managed to see it in 3D in english with Spanish subtitles. Unfortunately as it was a bank holiday here they hiked the price up to S17.50 (about £5). Cheeky gits. Still, want to see it again. 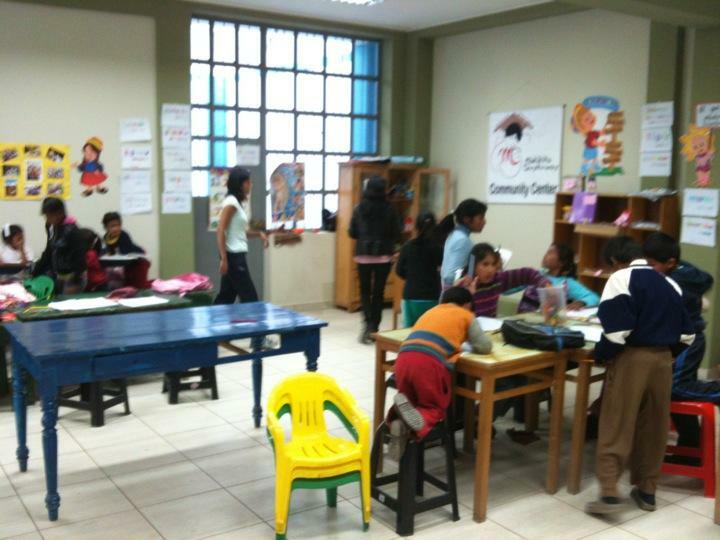 Last Wednesday I took my first English lesson with los niños at Makakita. Me and Alicia prepared a work sheet which involved running through colours, then shapes, then they had to draw a coloured shape e.g. A blue circle. Julianna wasnt there to help and getting the kids to sit down so we could start was a real challenge. Once we rounded them all up though, we were suprised at just how eager they were to listen and participate, I stood at the front of the class with the whiteboard running through pronunciation and the difference between the English and spanish words, getting the kids the repeat what I'm saying and write down the words. Alicia and Sandra worked directly with the kids filling out the worksheets. At the end we had trouble getting them to go home. All-in-all a great success. A few new volunteers have arrived as well, Christina from Austria, Anne from France and very recently Colette from the UK which is making it feel quiet busy, there are more things to do with more people which is always nice. At the weekend we took our first organised trip in Huancayo. Alicia, Sandra, Christina, Orit, Anne and I decided to hike the nearby Glacier. We met at 8am in the centre of town where we hopped onto a small bus and took an hour and a half bus trip up to our starting point, a wooden farm shack in the middle of no where at 4500 meters above sea level. We ordered food for later (Me and Alicia choose the lamb soup - the skinned lambs hides hanging out the front suggests it'd be very fresh). We set off with our group including us, a bunch of other Peruvians and our two guides. We started up a fairly steep hill and you could already feel the air thinning out but it was dry and not too cold, so all was good. After about an hour we stopped at the top of the rocky hillside where we could see our first glimpse of snow in the distance - still a long way to go yet. Our tour guide (Alanna) explained that this was a sacred site and showed us a traditional ritual where we had to all put 2 pieces of fruit into a hole in the ground along with some berries. She then passes around some alcoholic spirit for us to try, very strong, which was made apparent when she then lit the fruit alight with it. Apparently tradition is we should return 24 hours later to eat what's left - no chance. Unfortunately at this point Alicia was starting to feel ill, but as we continued to walk she felt better. The altitude was very noticeable then, the air was thinner and got quite a bit colder. We got to try some coca leaves that are suppose to help with the altitude, you have to chew them like tobacco and split them out. They are not tasty. On the way up we get told Pumas live on the mountain and we actually see tracks in the mud! ( Alicia: i mentioned the noticeable piles of poo "poo mounds" to which she said Si. Hay pumas aqui! "yes pumas here") We also get great views of a couple of lakes and lagunas scattered through the mountains. The most impressive of all is the Laguna Coche Grande which is an amazing blue colour that not even the surrounding lagunas have. We are told it's to do with a specific mineral that this particular lagunas has. About 2.5 hours in and we can see our destination getting closer, the group is spread a little sparsely now as people are slowing down due to the difficulty in breathing. Every slight slope up hill makes you completely out of breath. I arrived at the Glacier just ahead of Alicia. It looks amazing but I did wonder how we were going to get onto it. All I see is our bus driver (and other tour guide) the otherside of this gap fill with a narrow, steep bit of ice followed by a even steeper ice path. Just as I'm thinking "how am I going to get up THAT??" I see the bus driver casually waving one end of this scarf in my direction. I grab the end and I pull myself onto the glacier. Getting to the top is tricky as I slip a couple of times and it occurs to me there is nothing to stop me sliding down and into the gap between the glacier and the mountainside. I get to the top to be greeted by a couple of others who've made it up already which includes Sandra. Alicia and the others followed soon after, luckily there was a rope that'd been set up to help everyone get onto the glacier and up to the top by this point. Alicia came to the top looking a little shaken, she slipped getting onto the glacier which was pretty scary. But she's there and after a hard 3 hour hike we are both at just over 5200 meters above sea level. Equal to the 3rd highest mountain in Europe. We have time to have a wonder around some of the glacier although we are warned not to go too high as its unsafe (the peak is another 1000 meters up). We took a group picture and I climbed a little higher to slide down the glacier on a plastic sheet. Great fun! Despite the altitude we all felt pretty good (if a little breathless). It came time to climb down the glacier, which turns out is more difficult then getting up. It takes a long time but eventually we all got back on rocky ground without incident. Time to hike down - another 3 hour hike. On the way down I start feeling pretty bad pretty quickly, I get a splitting headache and am feeling sick and dizzy (it's like being really drunk and really hungover at the same time), not great considering the amount of time we've got left to walk. Alicia comments that I'm walking all over the place, staggering and stumbling over rocks, luckily she is feeling ok on the way down. The few times we have to walk along a narrow path of loose stones (followed by a hefty near virtual drop) I have to take it very slow and concentrate intensely on not staggering, which makes my headache worse. But I'm not the only one, Anne was suffering badly as well along with a couple of Peruvians. Odd that it should be on the way down. It made it hard to enjoy the views and the fact the clouds rolled in so we were walking in them which was very cool, even if it means we had little visibility for most of the way down. We all got to the bottom all tired but happy with our achievement. Me and Anne are feeling dreadful. Then comes the soup.....the lamb maybe fresh, but it's still so grim. It's hard to describe. It was watery soup with this one chunk of what looked like rib cage cover in white grisly bits. I was heaving and had to go wait outside without touching the food (outside the shack is in cloud tho, so it's wet and cold - on the plus side I get up close to a herd of llamas wondering about). It's dark by the time we got on the bus, still unsure if a few of us are going to be sick on the way back. It was interesting going through the twisting turning unlit mountain roads. Another 1.5 hours and back to Huancayo. We taxi'd it back to our flat and chill out. This was Sandra's last full night in Huancayo and I'd said I'd go out. But I felt so bad I couldn't face it. My head killed so I needed to close my eyes to help relieve the pressure. Thought I'll just have a doze and see how I feel. glance at the clock its only 7pm, I should be fine in a few hours. 9am the next morning I wake up. I feel absolutely fine now. Luckily Sandra didn't go out in the end so I don't feel too bad. Unfortunately Alicia and Orit were both feeling bad. Some sort of delayed reaction? They were both feeling pretty poorly so Alicia spent most of the day resting. In the evening we all felt well enough to head out for a meal to say farewell to Sandra, which was a shame to see her go. It's been great having her around and now it'll mean we'll be in the flat ourselves. She gave us an Astrix and Obolix children's book in Spanish to help with our learning, which is both amusing and helpful. We saw her off and turn in ready for work and lessons in the morning. Paul A hey guys, been reading your blogs and it seems like an amazing trip, dont worry about the illness makes it more interesting to read!